M T D O c t o b e r 2 0 1 8 66 F o c u s O n I n d u s t r y T he reinvention of Sears Auto Centers continues. When Kmart Holding Corp. purchased Sears, Roebuck & Co. in November 2003, there were 870 Sears Auto Centers. Nearly 15 years later, Modern Tire Dealer estimates there will soon be 356 le standing, a decrease of 59%. But in the last two years, Sears Holdings Corp. has made three major moves designed to move its automotive retail chain forward. Sears began selling DieHard brand tires in August 2016. e company decided to leverage the iconic brand following a study of nearly 600 consumers. e first DieHard Auto Center Driven by Sears opened in San Antonio in 2017. Before the year was out, Sears opened two more DieHard Auto Centers in metropolitan Detroit. Sears agreed to provide full-service tire installation and balanc- ing for customers who purchase any brand of tires – including DieHard -- on Amazon.com. 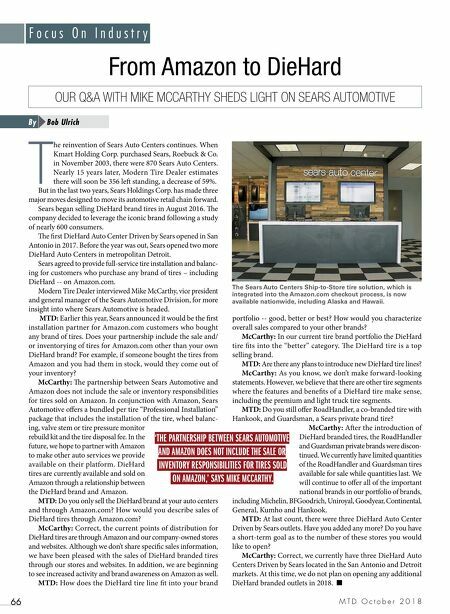 Modern Tire Dealer interviewed Mike McCarthy, vice president and general manager of the Sears Automotive Division, for more insight into where Sears Automotive is headed. MTD: Earlier this year, Sears announced it would be the first installation partner for Amazon.com customers who bought any brand of tires. 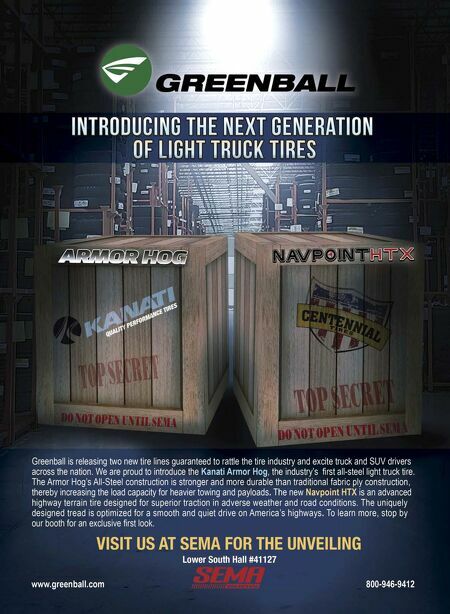 Does your partnership include the sale and/ or inventorying of tires for Amazon.com other than your own DieHard brand? For example, if someone bought the tires from Amazon and you had them in stock, would they come out of your inventory? McCarthy: e partnership between Sears Automotive and Amazon does not include the sale or inventory responsibilities for tires sold on Amazon. In conjunction with Amazon, Sears Automotive offers a bundled per tire "Professional Installation" package that includes the installation of the tire, wheel balanc- ing, valve stem or tire pressure monitor rebuild kit and the tire disposal fee. In the future, we hope to partner with Amazon to make other auto services we provide available on their platform. DieHard tires are currently available and sold on Amazon through a relationship between the DieHard brand and Amazon. MTD: Do you only sell the DieHard brand at your auto centers and through Amazon.com? How would you describe sales of DieHard tires through Amazon.com? McCarthy: Correct, the current points of distribution for DieHard tires are through Amazon and our company-owned stores and websites. Although we don't share specific sales information, we have been pleased with the sales of DieHard branded tires through our stores and websites. In addition, we are beginning to see increased activity and brand awareness on Amazon as well. MTD: How does the DieHard tire line fit into your brand portfolio -- good, better or best? How would you characterize overall sales compared to your other brands? McCarthy: In our current tire brand portfolio the DieHard tire fits into the "better" category. e DieHard tire is a top selling brand. MTD: Are there any plans to introduce new DieHard tire lines? McCarthy: As you know, we don't make forward-looking statements. However, we believe that there are other tire segments where the features and benefits of a DieHard tire make sense, including the premium and light truck tire segments. MTD: Do you still offer RoadHandler, a co-branded tire with Hankook, and Guardsman, a Sears private brand tire? McCarthy: Aer the introduction of DieHard branded tires, the RoadHandler and Guardsman private brands were discon- tinued. We currently have limited quantities of the RoadHandler and Guardsman tires available for sale while quantities last. We will continue to offer all of the important national brands in our portfolio of brands, including Michelin, BFGoodrich, Uniroyal, Goodyear, Continental, General, Kumho and Hankook. MTD: At last count, there were three DieHard Auto Center Driven by Sears outlets. Have you added any more? Do you have a short-term goal as to the number of these stores you would like to open? McCarthy: Correct, we currently have three DieHard Auto Centers Driven by Sears located in the San Antonio and Detroit markets. At this time, we do not plan on opening any additional DieHard branded outlets in 2018. ■ From Amazon to DieHard 'THE PARTNERSHIP BETWEEN SEARS AUTOMOTIVE AND AMAZON DOES NOT INCLUDE THE SALE OR INVENTORY RESPONSIBILITIES FOR TIRES SOLD ON AMAZON,' SAYS MIKE MCCARTHY. OUR Q&A WITH MIKE MCCARTHY SHEDS LIGHT ON SEARS AUTOMOTIVE Bob Ulrich By The Sears Auto Centers Ship-to-Store tire solution, which is integrated into the Amazon.com checkout process, is now available nationwide, including Alaska and Hawaii.